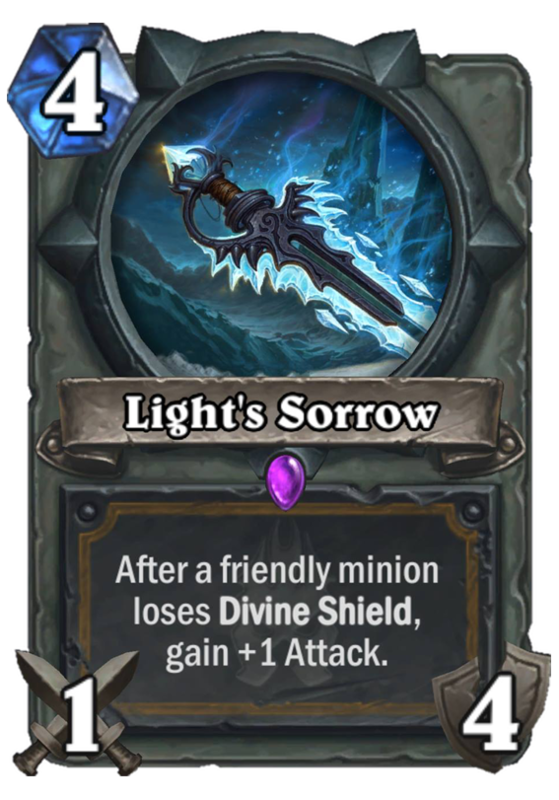 Light’s Sorrow is a 4 Mana Cost Epic Paladin Weapon card from the Knights of the Frozen Throne set! After a friendly minion loses Divine Shield, gain +1 Attack. Rating: 1.9/5. From 1617 votes. 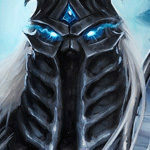 The sword the art depicts is called Hailstorm, not Light’s Sorrow, in WoW. Though they’ve a history of doing slight changes like that by now. 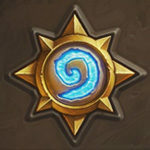 FYI anyone who is interested can look up the nitty gritty of game mechanics and card interactions on numerous Hearthstone dedicated websites like Hearthpwn and others. More pointedly, this does not proc. 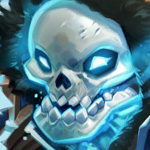 unless it is equipped (it would require special wording like the original Bolvar in order to do so) and my personal opinion, given the already abundant number of divine shield minions present in the game and divine shield augments available to paladin (all prior to this set), is that it would be overpowered to hell. Prediction: 3-4 mana paladin spell: Give your minions divine shield. 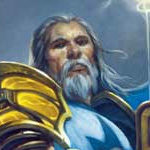 Like with the legendary, this card vastly depends on how much support Divine Shield Pally gets. In theory, popping two shields makes this thing worth it, and anything more is just amazing. Plus, since it’s a weapon, it’s more likely to stick around to see those shields pop than the legendary. One huge problem though is that at 4 mana, it competes with Truesilver, a much faster card. Maybe something happens with this card… but I currently find it doubtful. We’ll see what happens when we see the rest of the set and the Divine Support. Has some real potential once it hits 3 attack it’s already over its expected value lets hope that divine pally could work else this is useless ofcourse. 8/10 probably actually going to work very well seeing as 2 cards released for pally both have great divine shield synergy. After seeing this and the new Bolvar, can we assume that Divine Shield Pally will become a new archetype? Honestly, I would hope so. 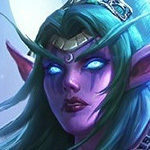 In the video he first play Light’s sorrow, then he plays Blood knight. Really pushing the Divine Shield build this time, aren’t they. If everything goes perfectly, by turn 4 you can potentially get this to like 3 or 4 attack? Talking Argent Squire and Scarlet Crusader…cards that have lost favor a good while ago. Think it’s too restricting in a world where Truesilver continues to exist. The real interesting combo is a bunch of Divine Shields with Blood Knight. Then you empower this and Bolvar. I don’t know if that will ever happen, though. I agree that 90% of the time (at least in the current meta) you’d want the Champion. A greedy deck might run both. Four durability means the potential for a lot of value. As I said below, that could improve matchups against control but could be a liability against aggro and midrange. Very true, a greedy deck could run both weapons depending on which paladin decklist is most viable and what type of meta knights of the frozen throne will be like. From the wording, I would guess it will get the +1 attack even while in your hand, and will continue getting +1s while equipped. Keep in mind that just two +1s makes this a 4-cost Assassin’s Blade, which is not bad at all. 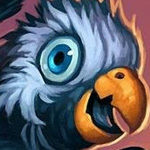 Vs. Aggro: Too slow. And you can’t afford to trade health for value. Vs. Midrange: Decent. If you get lucky with divine shield minions, you could pump this up enough to shut down their board. Still risky to trade health for value because many midrange decks have burst. Vs. Control: Potentially excellent. Getting a 3- or 4-for-1 with this could be a huge asset, and you’ll have time to make up for the lost health. And you’ll have time to wait for it to get pumped, so you won’t have to rely so heavily on lucky draws. Not good enough to build a deck around, but could be solid in a deck that already runs some strong divine shield minions. Luck will have a big impact on how good this is because it will depend on how early you draw it and what minions you happen to have drawn.